The Twenty-seventh Amendment to the United States Constitution (Amendment XXVII) has to do with the salaries paid to members of the United States Congress. Congress is made of two "Houses," and the members of each House serve different terms (amounts of time in office). 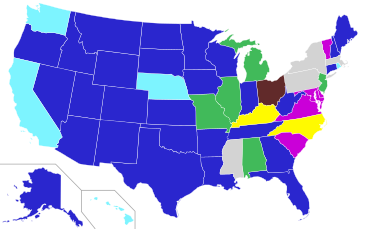 Members of the United States Senate serve six-year terms, and members of the United States House of Representatives serve two years each. The Twenty-seventh Amendment says that no law can change Congresspeople's salaries until a new two-year term for Representatives starts. As of 2016, the Twenty-seventh amendment is the last amendment that has been added to the Constitution. It took longer for the states to ratify this amendment than any other in history. [a] The 1st United States Congress sent the suggested amendment to the states for their approval on September 25, 1789. It was not until May 7, 1992, that enough states ratified the amendment for it to be added to the Constitution. The ratification process had taken 202 years, 7 months, and 12 days – the longest in United States history. On September 25, 1789, the first United States Congress gave a group of 12 amendments to the states for their approval. Written by James Madison, these were the first 12 Constitutional amendments ever written. One of them was an amendment about salaries for Members of Congress. Madison wanted to protect against Congresspeople being able to give themselves raises whenever they wanted to, while they were in the middle of their terms and the people could not vote them out. In 1791, the states ratified ten of the 12 suggested amendments. These ten amendments became the Bill of Rights. However, the state did not ratify the other two amendments out of the 12 – including the one on limiting pay for Congresspeople. James Madison first proposed this amendment in the United States House of Representatives on June 8, 1789. On August 24, 1789, the House passed the suggested amendment and sixteen others. The proposals went next to the United States Senate, which made 26 different changes to the House's suggested amendments. After taking out some parts of the House amendments, and combining others, the Senate approved a package of twelve suggested amendments on September 9, 1789. Now a committee of House and Senate members had to meet to figure out a compromise and come up with amendments that they could all agree on. After three days, they had come up with 12 suggested amendments, which they brought back to the full House and Senate. That same day – September 24, 1789 – the House agreed on the 12 proposed amendments. The next day, the Senate agreed too. The 12 amendments included the one on Congressional pay. Congress sent the package of 12 amendments to the states on September 25, 1789. For these amendments to be added to the Constitution, three-fourths of the state legislatures would have to ratify (approve) the amendments. At the time, there were only 11 states (North Carolina and Rhode Island had not ratified the Constitution yet[b]). This meant just nine states would have to approve the amendments to add them to the Constitution. On December 15, 1791, the states ratified ten of the twelve suggested amendments. These got added to the Constitution together as the Bill of Rights. However, at this time, only six states had ratified the Congressional pay amendment. Over the next 186 years, only two more states ratified the Amendment. Meanwhile, many more states joined the United States. This meant that a larger number of states would need to ratify the amendment to get it added to the Constitution, since three-fourths of the state legislatures needed to ratify it, and there were more and more states as time went on. 7 Ohio May 6, 1873 84 Ratified as a protest against the 1873 "Salary Grab Act"
↑ For an amendment to be added to the Constitution, two-thirds of both Houses of Congress, and then three-fourths of the state legislatures, have to agree on it. There are a few other ways for amendments to be ratified, but they are very uncommon. See the page on Article Five of the United States Constitution for more information. ↑ See the page on Article Seven of the United States Constitution for more details. ↑ Kentucky should have been counted as the 7th state to ratify the Amendment. However, it was not until 1992 that anybody realized Kentucky ratified the Amendment in 1792. By then, the Archivist of the United States had already confirmed that the Amendment was added to the Constitution on May 7, 1992, when Michigan ratified it. Officially, though, if Alabama were included, the Amendment would have been ratified on May 5, 1992, when Missouri signed. ↑ 1.0 1.1 "U.S. Constitution: Article V". Legal Information Institute. Cornell University Law School. 2012. Retrieved March 17, 2016. ↑ 2.0 2.1 "Constitution of the United States: Amendments 11-27". Charters of Freedom. United States National Archives and Records Administration. Retrieved March 17, 2016. ↑ 3.0 3.1 3.2 "Historical Highlights: The 27th Amendment". Office of History, Art, and Archives. United States House of Representatives. Retrieved March 19, 2016. ↑ Representative James Madison (June 8, 1789). Speech Proposing Amendments to the Constitution (Speech). United States House of Representatives, Washington, D.C.. http://teachingamericanhistory.org/bor/madison_17890608/#. Retrieved March 19, 2016. ↑ Labunski, Richard E. (2006). James Madison and the struggle for the Bill of Rights. Oxford University Press. pp. 235–237. ISBN 978-0-19-518105-0. ↑ Schwartz, Bernard (2002). The Great Rights of Mankind: A History of the American Bill of Rights. Lanham, Maryland: Rowman & Littlefield Publishers, Inc. p. 186. ISBN 0-945612-28-1. ↑ "The States and the Ratification Process". Center for the Study of the American Constitution. University of Wisconsin-Madison. Retrieved March 13, 2016. ↑ Congressional Research Service (Kenneth R. Thomas and Larry M. Eig (eds.)) (2013). The Constitution of the United States of America: Analysis and Interpretation (PDF) (Report). United States Government Printing Office. pp. 44, 2273–2274. Retrieved March 19, 2016. ↑ "House Bill 1052 / S.L. 1989-572: Ratify Congressional Pay Amendment, 1989-1990 Session". North Carolina General Assembly. Retrieved March 19, 2016. ↑ "Congressional Record, 102nd Congress (1991-1992): The Pay Amendment". THOMAS. United States Library of Congress. May 19, 1992. Retrieved March 19, 2016. ↑ Flanigan, Timothy E. (1992). "Memorandum Opinion for the Counsel to the President". Office of Legal Counsel. United States Department of Justice. Archived from the original on April 14, 2014. Retrieved March 19, 2016. ↑ Dean, John W. (September 27, 2002). "The Telling Tale of the Twenty-Seventh Amendment". FindLaw. Retrieved March 19, 2016. ↑ "The Sleeper Wakes: The History and Legacy of the Twenty-Seventh Amendment". Fordham Law Review 61 (3): 497-557. 1992. http://ir.lawnet.fordham.edu/cgi/viewcontent.cgi?article=3017&context=flr. Retrieved March 19, 2016. ↑ 14.0 14.1 14.2 James J. Kilpatrick, ed. (1961). The Constitution of the United States and Amendments Thereto. Virginia Commission on Constitutional Government. p. 64. ASIN B000JWI5Y2. This page was last changed on 31 August 2017, at 14:03.